Geometry is the set of all the measurements on a bike. Every angle and tube length is a part of a bike’s overall geometry. Geometry affects the feel of a bike more than anything else. This is why you can’t take a cross country bike and turn it into a downhill bike. No matter how bombproof you build it, it will still feel out of place and awkward because the geometry is geared towards cross country. The headtube angle is the angle the headtube forms with the ground. The steeper this angle is, the faster a bike will turn and the better it will climb. A slacker angle provides for slower steering and is a bit harder to climb with but provides stability at higher speeds. A typical cross country bike will have a steep headtube angle, usually around 71 degrees. A downhill bike on the other hand, will have a much slacker angle, closer to 65 degrees. The wheelbase is the distance from axle to axle. The longer it is, the more stable the ride will be. However, this added stability sacrifices maneuverability, especially at lower speeds. Conversely a shorter wheelbase will handle quicker and livelier. It will also make a bike easier to spin. Longer wheelbases tend to be found on downhill bikes because they benefit greatly from the added stability. The Demo 8, for instance, has a 47 inch wheelbase. Street bikes benefit more from the agility of a shorter wheelbase. For example, the NS Suburban has a 40.75" wheelbase. The length of a bike’s chainstays directly affects its wheelbase length which affects maneuverability and stability; thus shorter chainstays make for a snappier ride. Shortened stays also make a bike easier to manual, hop, and pop. Short stays also make a bike easier to control in the air. This is why short chainstays are a must have for dirt jumping and street bikes. Shorter chainstays also leave less room for flex, causing immediate power delivery to the rear wheel. For reference, the Session 88 DH has 17.3" stays whereas a Dobermann Pinscher's stays can get as short as 14.75" with the wheel slammed. The standover height is basically, the inseam of a bike. Low standover heights are sought after in all disciplines of mountain biking simply because no one likes taking hits to the crown jewels. Slipping a pedal often ends in tragedy for the male genitalia; a lower standover height reduces the chances of this occurring. Dirtjumpers and slopestyle riders also prefer lower standover heights because it makes certain tricks, such as cans, easier. Shorter seat tubes tend to have lower standover but this is not always the case. Recent advancements in hydroforming (essentially bending) aluminum tubes have lead to a dramatic decrease in standover heights in newer model bikes. Giant, Specialized, Santa Cruz, and Norco’s new lineups are great examples of this new trend. Bottom bracket height is most important when it comes to cornering. The lower the bottom bracket, the lower the center of gravity and the easier a bike will corner. However, clearance is also an issue. If the bottom bracket is too low, then the cranks, pedals, and bottom bracket shell will be prone to hitting rocks and other trail obstacles. Also, the bottom bracket height lowers as a bike moves through its travel. Part of the reason 14 inch travel bikes never caught on is because the bottom brackets had to be placed ridiculously high so that the cranks wouldn’t hit the ground when the linkage compressed. This made these bikes incredibly unstable through corners and relatively useless for anything other than hucking. This is also the reason why some frames can be run with a 24 inch wheel option while others cannot. This is the length between the center of the seat tube and the center of the head tube, as the crow flies (a straight line, ignoring any curves in the actual top tube). Shortening it can lead to a shorter wheel base. The ideal top tube length varies from user to user. Larger frames have longer top tubes. Some people have longer arms and torsos than others, thus they feel more at home on longer top tubes. If you buy a bike and feel the geometry is a bit too stretched or cramped, experiment with different stem lengths and setback seatposts before returning or exchanging the frame. This is much like the headtube angle except instead of the headtube, it’s the angle the seat tube forms with the ground. The seat tube angle affects where the cyclist will be seated on the bike. This affects the rider's alignment with the cranks. A steeper angle moves the hips forward which allows the rider to turn the cranks faster. This is why standing up provides more sprinting power. Do you like articles like this or do you have something to say that would help others out in a technical manner? Well then contact me at brule.pinkbike.com and we'll get it out there for everyone to read! Some very good information in there. This will seventy be a help to people. This is what I believe most people would like to see in the news/articles section instead of infomercials. Good work. Very good article, i knew about geometry but not this detailed, Wicked post brule! Now I'll be more informed about wich bike I should choose, depending on the use and my mesurements. It'l probably make save a lot of money to poeple, they will choose the bike that perfectly fit them. Thanks! If you like my writing, I've just recently started a blog. Click to show your support! like it, but you forgot to sing the praises of a good long chainstay. longer chainstays give you more front wheel grip - because you have more weight over the front wheel, and they help when climbing for the same reason; you can pedal hard without just lifting the front wheel. I'm glad that someone else realises this fact. short chainstays seem to be the 'in thing' right now. But what you said is very true. Both of you are in the right, but all of this boils down to what you want your bike for. It is easier to manual on shorter chainstay lengths whereas grip will increase on longer ones. The wise thing to do is to balance pros and cons against each other, so that you can make up your mind and come up with the right set up which will meet your individual needs. I know what you mean when you say shorter chainstay lengths are in now, but an XC racer with a short chaistay is just a contraption and the same could be said about DJ rigs with very long chainstay lenghts, speaking of which, you won't be able to find any about. Can you imagine what it would be like to build a DJ rig upon a 20'' long chainstay frame? And what about a racer just meassuring 14'' in the rear? What you say it true though. I can not stand long chainstays. They make the bike feel sloppy. Only if the frame is flexy. get a stiff frame and your laughing. Sure, but iggz is still entitled to have his own oppinion on the matter. He knows why he hates long chainstays, they do please me though, in a way, but this, as I am saying, is a matter of taste. The bike a man chooses for himself is personal, as it is the rider's needs the sort of thing which triggers off his decision to stay true to this or that particular set-up. What I think important though is to be open to other people's opinons and ideas. I am only saying it because it is also possible to expand someone's individual knowledge when they just listen to more experienced riders and what they have to say. more front wheel grip, and easier climbing, they're not unfashionable this week are they? - i'm very old, it's hard to keep up with what's 'in'. if you want less front wheel grip, and harder climbing, then go-short-stay-go! whoo-woo! You are right dude, and as an overall achievement, do not forget to mention more wheelbase too, which is kind of an improvement in terms of stability. since when is putting weight on the front tire so hard? maybe steep, seated xc climbing. but most people choose to optimize their bike's geometry for reasons other than just climbing. I feel like i already have to lean back enough on steep downhills with short chainstays and i never have a problem putting enough weight on the front end, just lean forward or stand up a bit more. the best way to find out if a bike geometry works for your body size and riding style, is to test ride the bike you are interested in, a good bike shop /dealer should offer you this possibility, otherwise take your money elsewhere! I could not agree more. And do not forget mentioning manufactures usually give costumers the effective one, which is very misleading if you come to think of it ever since the ratio actual/effective length will determine where you gonna sit on your bike. For 18'' long seat tubes costumers will surely expect at list some 23.5'' in the tt or more, but again, it is a no-nonsense approach to think 22.5 instead if you come from your individual needs. It is important to note that as you pull the saddle out to gain more distance from the tt, you also get farther away from the bike's front end and either longer or shorter stems can also make up for the difference. In the picture shown above, for instance, only the effective tt length is given, as normal, and it does not say whether it is the actual or the effective one (it just reads â€˜tt lenghtâ€™). The difference is critical though as the actual tt length is always shorter than the effective one. wow thanks that was really helpfull... great blog! beef, you are wet! good job. Great article, but what about stack and reach? Stack, reach, chainstay, and head angle are the real factors in how a bike feels and handles. I am a fan of short chainstays on my cross country/freeride bike and my dh bike. A bike with long chainstays is too hard to bunny hop and kind of dangerous on low speed drops= less fun!! So for me short chainstays = FUN and that's what it's all about. I quite agrre with you: I find it harder to bonny-hop on longer chainstays too. I thought this was a great starting point for this topic and would like to see it go into further detail. For example why does the Santa Cruz V10 have a 67 head tube angle when most World Cup bikes are at 65. Does the angle change when the sag is set correctly? Additionaly Minnar and Peat both run a 60mm stem I think. Seems like a funny size. Also Peat has a custom frame with a longer head tube. (referencing my memory of the Santa Cruz website videos) Finally I think I saw Ben Reid doing "custom" mods to his stem to reduce the stack height. What about Dan Atherton's 4X bike. So cool. I'd love to see an article explaining what the pros are trying to accomplish. In all disciplines really. Psyched on the article and all the great reader posts. great article. ive been riding 35 years now, im 39. on mtb, bmx and british clunker equivalents for most of this time. i still get confused by the angles in tables of data in the mags but i always seem to know how a bike will ride now just by looking at its shape. i wish there was a bike shape modeller online that you could input the angles/lengths and compare different bike shapes by flicking between them... if theres a programmer out there please build one! The article defines Wheelbase as the "distance from axle to axle." The drawing should be corrected as it shows the rear wheelbase ending point to the left of the drop out (past the axel). Not a major issue, just a little confusing to the viewer. This is very good information being provided by PB. Anybody can more or less pull any trick on any bike, but the frame's geometrics is something which needs taking into account when planning on buyin a bike for some particular purpose. Many people will scale TT lenghts down to sizes (usually S, M and L), but what lenght a man chooses for his bike is always brought foward as a matter of taste and purpose. My XC bike, for example, is some 24'' long whereas my full sus and DJ rigs are only 22.25'' and 21.5'' respectively. The reason for this is quite obvious. If it is speed what I am after, I'd be needing a long top tube lenght so that I can lean onto the bike and charge forward. So what about shorter tt lenghts then? As you are being airborne down slopes and sigle track units short top tube lenghs will help in keeping the handlebar close to your chest as this will improve the bikes bonny-hopping capabilities. Another thing is I do usually find it easier to pull a wheely out on longer tt lenght bikes (it is just easier to lay back on the bike and seek for the fulcrum to balance back and forth. If you can, for instance, manual your bike, you will probably find that shorter chainstay lenghts will make it easier. This ad is just so good in that it will make you think about proposed sizing standards and your individual purpose (that is, what you want the bike for). Just keep it moving people: well done! a good article because when buying a bike you get all the info on the specs but like many people you can only make use of most of it and not all a majority is your personal prefrence but with this it can tell you why you like it so. a good article and we should have much more of these on pinkbike but it was a little short but good job! Yes it will change the head tube angle. The longer the fork installed will push the wheelbase longer creating a decrease in head tube angle. If you install a shorter fork the wheel base is shortened and the head tube angle will increase. There is usually a spec for a frame on which travel fork the manufacturer feels is the best suited. You can put any size fork on, as long as it is within the spec range allowed by the manufacturer. If you don't care about warranty and your safety you can go crazy if you want and put on anything your heart desires. Really it depends on rider preference what fork travel suits the bike. The head tube's angle stays the same whether you have a 160mm long travel put in or a shorter one. If you know your maths you will probably realize it is pointless to say how big a triangle might be as its angles will remain the same despite its actual size. Just think about it. The only thing you need to think about is how the bb height will be affected as you gain more travel in the front end. For stability and good cornering performance, the closer a bb is to the ground the better off riders will be. Say for example my Slayer ride. RM bicycles say the bike suits 160mm travel forks but I never go as far as that as the bike's handling feels really sloppy. One the other side of things, everybody knows the Rockhopper is a 100mm travel ride, but I always think it just could do with 120mm as the bb height is relatively low. No head tubeâ€™s angles will be affected in the process, but just the bb height. You're wrong. The angle is the angle formed between the ground and the fork. If the fork is longer, the angle will be slacker. Yes I am, but not so more because I am getting it wrong as it is, but just because I failed to explain myself properly. The thing is I've already done this experiment myself, and I know what I am saying. As the front travel gets longer and longer you also gaim more wheelbase, so the angle does actually change, but this difference, for so little a travel, is always missed by the eye. What I did find out though is that you do not need to pull the front travel out that much to get the bb height out of place; and this, is a perceptible change you can actually see. When a manufacturer explains that this or that model has a head angle of X degrees and so and so, he's saying it taking into account how far the costumer can actually pull the front travel out without compromising the bikes handling. However, you are right in that the angle which is formed between the ground and the fork will have to change as all three angles in a triangle add up to 360, but this is only true from a mathematical point of view. Let me put it this way: say that for each 100mm front travel you pull out you will loose 1 grade, but just 30mm added up in the front is more than enough to displace the bb height: this is where I was coming from. I guess I should have put some more thought into it before rushing into the conclusion, most particularly, just because what you guys are saying is very true. By the way, thank you for letting me know. Three angles in a triangle always add up to 180 degrees. Fantastic work Mr. Zhao, This is a brilliant piece, crystal clear and simple to digest. Even I understood it! Excellent work, a lot of readers will really appreciate this! Would've been better with Cori's mom somewhere in the geo chart. Like some of the others said, axle to crown height, reach and stack ( I think this is very important for DH), How to change geo with sag/axle to crown/wheel sizes etc., How the changes on geo effect bike handling/intented use. How forward and rearward pivot points effect handling/intended use. Not asking for much ah! good for beginners but certainly not up to par for advanced riders. information was all decent, some was much better than others and down sides or upsides of certain things were completely skipped over. Personally, I thought it could've done with more detail. It's all well and good as a noobs-guide to geometry, but I was hoping for a more thorough description of each dimension from a professional point of view (no discredit to AqueousBeef). Still, more in the right direction I think. if you didnt already know this information and you own a bike you're a bit silly. The important thing is what agles and lengths are good, unfortunately most people dont have a clue. When most of us "older" bikers started to join internet forums we already had years of reading magazines and biking, so we already had plenty of technical knowledge on bikes. The problem is when 14 olds start biking because is the new coolest thing on their school, or because their dad bought them a stinky and they join pinkbike on the 2nd month. They're the origin of 75% of the pointless threads that go on the forum. So I guess this type of article has great value by showing them some proper technical info. yh enough of the crappy adverts in this section pb needs more stuff like this! I don't know how you'd acurately measure the exact ht angle but i do know that the older marzocchi forks, with curved (non m-arch) crowns have a really tall axle to crown measurement compared to other forks of the same travel. i think like pre '05 or so.. it's enough to change the ht angle at least a degree maybe 2. The bike's behavior is dramatic affected by the head angle, fork height and fork trail. I would like to read something about. i totally agree. it would compliment this article very well. good job, i can use this at school.... now i can design my own frame!! what about front center,i like the short chainstays with long front center as it giver my legs more room. Isn't there some measurement Transition is trying to adapt from the bb to the top of the head tube? Wouldn't this be an important measurement? 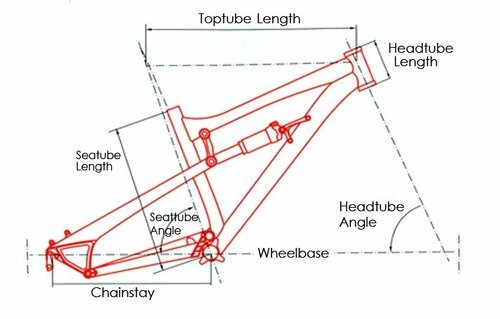 Yeah Transition is incorporating the "Reach and stack" style frame measurement into standard bicycle frame geometry measurements. It is a vertical measurement from the bottom bracket(stack), up to the intersection point (90deg) of the horizontal measurement from the center of the head tube running adjacent to the top tube (reach). It is a very important measurement when your are comparing your current frame to one you wish to purchase. Although all of these frame measurements are susceptible to many variables, in the form of different componentry installed on the frame. Example: A 160mm fork installed in place of a 140mm fork will decrease the head tube angle, shorten the reach of the assembled bike, and possibly lengthen the wheel base. anyone know if the length of forks effect the headtude angle (obviously effects handleing) but how and is there better lengths for differnt frames? I know that as a ROUGH guide, when you wind your TALAS or ATA down one inch, your head tube is now one degree steeper. I'm not quite sure if that is what you are asking, but there it is. uhh, the 3 angles in any traingle always add up to 360 degrees, and when you only lengthen only one side (longer fork) all three angles will change. so everything will change with a longer fork, bb height, seat tube angle.. in other words, your bb can't be raised (by lengthening the fork) without slackening the head angle. maybe you're confused with thinking that equilateral triangles always have equal length sides? that was a great article, learned alot. Very good article that explaine dme everything. Great article, also WasabiJim's comment above would be interesting too! Missing info about seat stay but gotta agree with above, you should have an idea about this before you are buying. Seat stays do not play a part in the geometry of a bike. Their angles and lengths are simply a direct correlation to chainstay length and seattube length. And that doesn't affect how a bike handles. nice article very easy to understand! nicely explained,very interesting,props to this. Awesome article! Two thumbs ups! OH and what he's shown is effective TT length not actual tt length. It's a Spicy. 100% sure. Trust me on this one!